The White Stag - Archenland is the third of Danu Slings inspired by Irish Author C.S. Lewis' beloved Narnia series. The White Stag, was he Aslan in disguise?, was a male deer whose origins and whereabouts are steeped in mystery. According to legend, whoever caught the beast would have their wishes granted. The tri-blend of Fern Leaf Merino Wool (26%), Moss Cotton (26%) and our signature White Irish Linen (48%) woven blend offers excellent support and comfort for babywearing of all ages, softening beautifully with use. This wrap is suitable for newborns and toddlers. Danu Slings have no wrong side, both are as stunning as each other. For well over a year after the Archenland Conflict, High King Peter, Queen Susan, King Edmund and Queen Lucy were told about the mythical beast by Mr.Tumnus. He said that it had "Once more appeared in his parts", indicating the Stag had been to Narnia before. They hunted the stag in Lantern Waste, near the Lamp-post, in order for the empire to have its wishes granted. However, they were unable to catch it, and instead unintentionally returned to Earth through Digory Kirke's Wardrobe, through which they reverted back into children, thus un-fulfilling their wishes. Ultimately, this brought an end to Narnia's Golden Age, and began its Dark Age. It's been theorized that the Stag was really Aslan in disguise, guiding them back to their world, as they had done all that they needed to do. 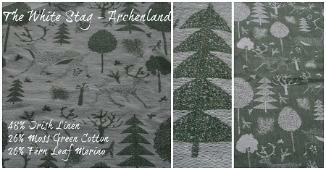 Archenland Archenland, officially the Kingdom of Archenland, was a mountainous country situated south of the Kingdom of Narnia and north of the Calormene Empire. Along with Narnia and other dominions, Archenland constituted part of the larger Narnian Empire. The seat of government was at Anvard, in the heart of the country. Anvard, the name of the castle, also gave the name to the city, which was the Kingdom's capital and only known populated area. The White Stag - Caspian is the fourth of Danu Slings inspired by Irish Author C.S. Lewis' beloved Narnia series. The White Stag, was he Aslan in disguise?, was a male deer whose origins and whereabouts are steeped in mystery. According to legend, whoever caught the beast would have their wishes granted. This is a stunningly intricate desigh, perfect for the festive season. Tago Purple Cotton (22%), Teal Cotton (23%) and our signature White Irish Linen (48%) woven blend offers excellent support and comfort for babywearing of all ages, softening beautifully with use. This wrap is suitable for newborns and toddlers. Danu Slings have no wrong side, both are as stunning as each other. Archenland Archenland, officially the Kingdom of Archenland, was a mountainous country situated south of Prince Caspian, later to become King Caspian X of Narnia, Lord of Cair Paravel and Emperor of The Lone Islands – also called "Caspian the Seafarer" and "Caspian the Navigator" — is the title character of the second book in the series, first introduced as the young nephew and heir of King Miraz of Narnia. Prince Caspian: The Return to Narnia is set 1300 years after the rule of High King Peter and his siblings, when Old Narnians have been driven into hiding by Caspian's ancestors the Telmarines. Caspian is also a central character in The Voyage of the Dawn Treader, and appears briefly at the beginning and end of The Silver Chair.